The legendary Emily Carr was primarily a painter, but she first gained recognition as an author, writing seven popular books that were also critically acclaimed about her journeys to remote Native communities and her life as a child in tumultuous Victoria, British Columbia at the start of the 20th century. A Book of Small collects 36 stories based on her frontier beginnings and stars a colorful cast of friends, family, neighbors, and strangers, from genteel socialites to saloon ruffians - all seen through the eyes of a curious, irrepressible girl. A constant throughout the book is Father, an unforgettable eccentric whom Carr portrays with telling humor. Carr's writing is as highly regarded today as when she was first published. In print continuously since its first publication in 1942, A Book of Small appears here with a fresh new design and an introduction by Sarah Ellis that offers historical and literary context for the book and its author. About Emily Carr (Author) : Emily Carr is a published author of children's books. 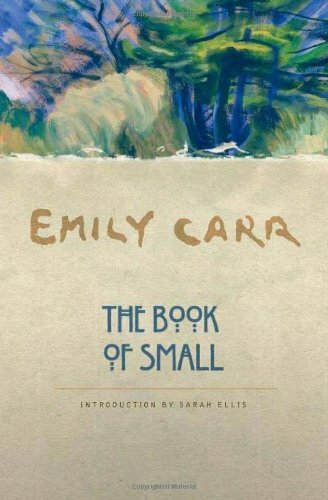 Some of the published credits of Emily Carr include The Book of Small. About Sarah Ellis (Introduction) : Sarah Ellis is a published author of children's books. Some of the published credits of Sarah Ellis include The Queen's Feet, Odd Man Out, Odd Man Out, and Salmon Forest.